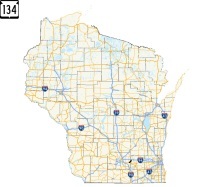 Quickie Summary: State “Trunk” Highway 134, essentially unchanged since its 1923 commissioning, connects Cambridge with the tiny burg of London and, via county highway connections, points north – eventually Waterloo. The Drive (South to North): Yep, this won’t take long. You start at U.S. 12/18 on the west side of Cambridge (pop. 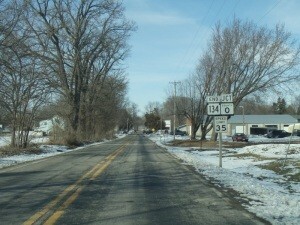 1,100), a charming town that straddles the Dane-Jefferson County line (much like Highway 134 does for a spell). Just to the west – and by “just” we mean within sight – is Highway 73, the main north-south state highway in the area. Pretty much AT the intersection where Highway 134 begins is the Matt Kinseth Museum & Fan Club Headquarters (700 Kenseth Way, 866-878-1717), a must for NASCAR fans – especially Wisconsin ones. Free to enter, the Museum features plenty of cars and exhibits that pay homage to the Cambridge native, who returns frequently. 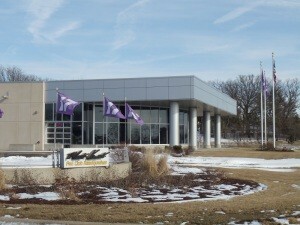 The Matt Kinseth Museum & Fan Club Headquarters holds a lot of NASCAR memorabilia, especially as its related to Kinseth’s impressive career on the circuit. It’s free to enter, but a stop at the gift shop is always encouraged. As long as you’re at the beginning on Highway 134, take a spin south on U.S. 12 and check out downtown Cambridge, a town long known as a destination for fine hand-crafted pottery. Today, it’s known just as much for great antiquing. Rowe Pottery Works (214 W. Main Street) is a great place for fans of ceramics and pots and is well known for salt-fired gray and blue pottery. Its founder Jim Rowe now has the place across the street, the Cambridge Stoneware Company (217 W. Main Street, 608-423-9700). There’s even a World Pottery Games festival every June. The Old Stone House is the oldest remaining building in Cambridge, built in 1851… it now houses a jewelry store. Just off Main on South Street, check out the Cambridge Historic School (213 South Street, 608-423-3327), a museum which features exhibits across a number of cultures and nostalgic displays all in coordinated layouts. Built in 1906, the school was designed by Cambridge native Ole Evinrude, famous for becoming the inventor of the outboard motor after he got frustrated rowing a boat manually on a hot day while trying to fetch ice cream for his girlfriend at the time. 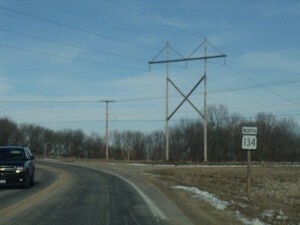 The beginning of Highway 134 heading north. This won’t take long. Cambridge is centered around Lake Ripley, a 418-acre lake that is not only popular with locals, but served as a tourist destination as far back as the 1890s while people from Chicago, Milwaukee and nearby Madison. For a spell, Cambridge was known as the “Umbrella City”, not for rain protection but rather all the beach umbrellas people stuck in the sand around Lake Ripley. Some of the village’s materials still use the moniker today. North of Cambridge, Highway 134 runs through sparsely-populated farmland and jogs northeast enough to land you square on the Dane-Jefferson county line, which it bisects right up to its sole destination, the tiny burg of London. 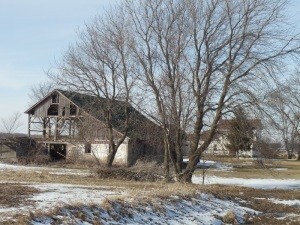 Not much has changed on this stretch since Highway 134 began in 1923, but some things do fade away… this barn may be deteriorating, but there’s a beauty in it just the same. 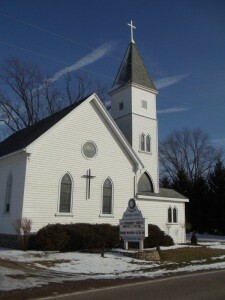 London (unincorporated) is home to the oldest Moravian church in Wisconsin and lies along the Glacial Drumlin Trail, a terrific rail-to-trail bike and snowmobile path that connects Waukesha to Cottage Grove, just east of Madison. In the early years, a small train named “The Cannonball” connected London with Cambridge, in a sort of early form of transit. Today, that connection is State Trunk Highway 134. The London Moravian Church was established in 1889 and continues on in its lovely building, just north of where Highway 134 becomes County Highway O. Less than three miles after it begins, Highway134 comes to an end in downtown London (yeah, it’s not a big downtown.) The road becomes County O and continues north if you’re interested. Otherwise, you can check out the Glacial Drumlin Trail in town or head back to Cambridge; it’s all good. So, where does one go from here? You can continue north on County O, which will eventually take you to Waterloo and Highways 19 and 89, or head back south four minutes to U.S. 12/18, and continue your journey to a bunch of other fantastic Wisconsin destinations. Enjoy! • Commissioned in 1923 to serve as a short spur to London, Highway 134 has remained unchanged ever since. • Highway 134 is one of the few state highways to end at a county highway. County O continues north into Jefferson County, leapfrogging I-94 and connecting to Waterloo. • A small train named "The Cannonball" once connected London with Cambridge; Highway 134 follows that path.